Welcome to a new week and according to mum a short work week for her. Woohoo for us, that means we get extra mum time! Mum finished up with outside work on Caturday. Thankfully no climbing on ladders this weekend, just pushing the grass eating Monster around one last time to even off the grass and chew up the last few leaves. We watched fevvers a bit both days. Mum worked on reading her book too. In general a quiet weekend. Mum spent some time with Grampie too on Sunday. The Pack - they beat Grampa Brett and the ViQueens in the dome. Grampa threw the ball to the wrong team once, but that helped swing the game. In general looked like an old man. On the other paw our QB ARodg looked great, 4 TD passes! The Colts - lost to Miss Millie's guys named Pat. Although they at least made it a little closer at the end. The Colts are having an off year, not as sharp as in previous years. Peyton had 4 TD's but also 3 INT's. One of my earliest furiends on the CB has runned off to The Bridge. Patches of The Big Piney Woods has left us behind. 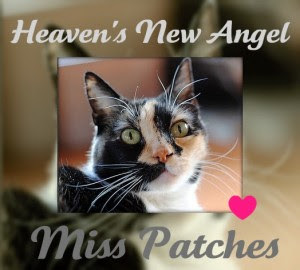 I will miss you Patches. You were a sweet ladycat, I think you hosted the first ever big party for the CB, when you had your nap-a-thon in January 2006. You taught me how to teleport so I could come to the party. Now we think nothing of popping over to see our buddies. You help host the Cat-O-lympics, and we sat in the woods to watch for fairies. Those were good time my furiend. Your sisfurs, Mittens, Mystrie and Precious Flower will miss you, me too. 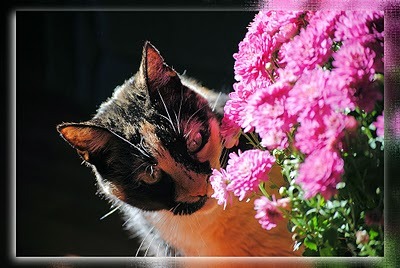 Purrs to your mom, Calico Mom Toni, your bean Dad too, they will miss you as well. The picture below is from her mum. Mum found the following somewhere. To keep us from waking you up at OhDarkThirty, try the following. 1 Make home as lightproof as possible so that it is hard for us to tell the time. At best mum does the second one as once mum gets home and has her dinner, then we can have play time. She does put out foods at her bedtime too and usually there is food left in the morning, so we don't have to wake her up early to gets more noms. Mum is pretty much back to walking normal again, the achy is going away. Maybe this weekend she will get all finished with the outside work. One last use of the grass eating monster. Mum is looking forward to the weekend already! Glad we have kitties here, mum wouldn't want to be thought of as a scoundrel! Mum continued to be busy all weekend. Caturday morning she got up, went outside in the drizzly rain and threw the leaves out of the rain gutters on the house. Which meant she had to wrasslin the big ladder around, climb up and down the ladder lots of times. When she was done she came inside and she was all wet and stinky! Thankfully she took a shower to make her all clean and smelling nice. Ducky and I made sure to snoopervise her from the windows. She didn't fall off the ladder, which meant we didn't have to figure out how to call 911. Then she gave the washy thing in the dungeon a big workout four loads on Caturday, three more on Sunday! Caturday was her normal stuff, Sunday was all of the throw rugs, some of which I had christened with yak over the past few weeks. But on Sunday mum was walking funny and slow. Seems all of her trips up and down the ladder made her legs all achy and stiff. She could hardly get out of bed on Sunday morning! She also made a visit to Grampie, one day he was sleeping so she didn't stay. The other they had a nice visit and mum took him his mail to read. He is still a bit confuzzled, probably will be from here on in, he asked about Grammie, who has gone to heaven ages ago. When mum reminded him of this, he could remember what year she went to heaven in. We hopes he gets his wish soon to join Grammie in heaven. Plus we watched fevvers with mum. We saw a big blue bird, mum said it was a blue jay. Mum says she has heard them but never seen them come to her feeders before. So she was happy to be able to count Mr Jay! The Pack - taking the weekend off, get to play Grampa Brett next weekend. Grampa Brett and the ViQueens - Da Bears beat them. The Colts - they won too. Mum didn't watch feetsball, she read most of a book about a lady who lived through the Reign of Terror in revolutionary France. Lots of history, and mum says interesting it is called Dancing to the Precipice by Caroline Moorehead, about a lady called Lucie de la Tour du Pin. What a long name! Yep kitties we made it to Friday, mum too. Although today she didn't get up to go day hunting! Not that we had much time with her during the day. She had stuff to do outside the house, see her green paper investment man, came home with way lots of her adult beverages for the holliday. Plus she went food shopping and I spyed some treats for us too! Then she did some stuff outside, got the car all nice and sparkly clean. Then cooked her last chick-hen breast on the outside grill. We only got a small taste. Tomorrow is a big day, mum has much more stuff to work on, but also, it is offically Ducky's 9 month Gotcha Day on the 13th. Yep back in February on Saturday the 13th he invaded, er, moved in with me and mum. Plus our official bird counting with mum starts this weekend. Project Feeder Watch begins a new season. We gotta help mum spy all of the fevvers in the yard. Hope everyone has a great weekend, we can relax, no Packer feetsball this weekend. Although I am sure mum will watch some games anyway. 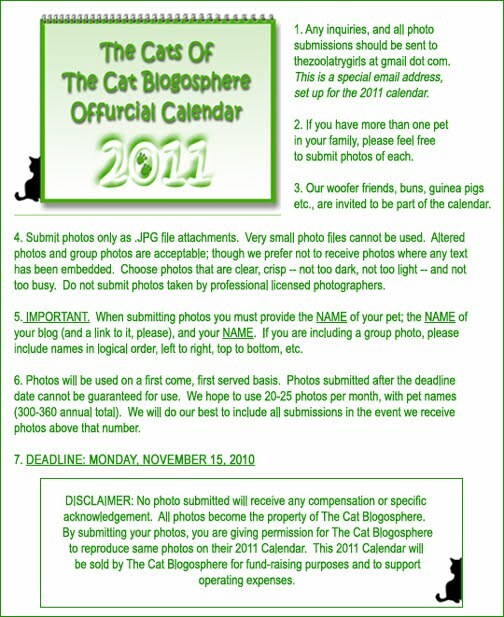 Hey everycat, our lovely lady furiends at Zoolatry need pictures for the CB 2011 Calendar. Sending in pics does not mean you have to buy a calendar. 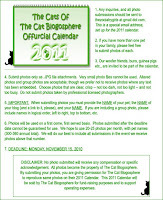 But the green papers they get from this help to keep the CB website going, and you know we call use the CB to keep track of news of our fellow blogging kitties. 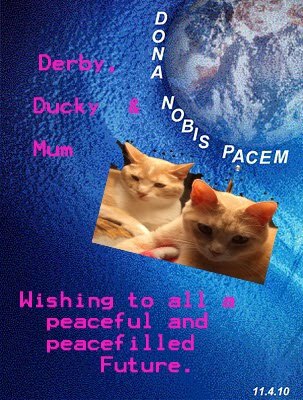 Ducky and I have sent in our pictures, I hope you will too. It is fun to pick out our buddies on the calendar. As they say on the commerical JUST DO IT. Several of you asked about where mum found Callie the Corpulent Calico, or Triple C, shorter, easier to say. She was found in the bedding department of a local department store. Boston Store mum says, part of the Bon Ton corporate chain. Mum did find her on one of their websites, so you can see the link here. Mum found her on sale and the check out lady even gave her a bigger discount cuz mum says she had to wait extra. 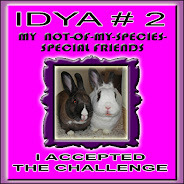 Different animals are available, you can search on Livingquarters Animal Pals. Here are two other pictures, from the other side and a rear view. We don't think she will blog much, she is just here to hang out and keep us company. 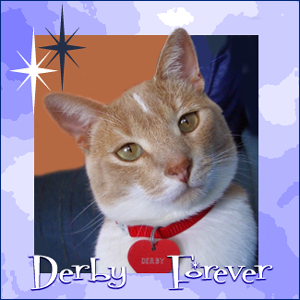 Derby and I are not kittens anymore, at least not age wise. In our hearts we will always be kittens. But my favorite sweetie in waiting, Dora, is a kitten and just learning all sort of things with her beans. Of course Dora is anything but ordinary! Well we thinks the clocking chaning thing went OK here. Mum went out on Caturday evening for her car club awards dinner. Came home and went to sleep, said she wanted to actually get that extra hour of sleeps. She was furry buzy inside and out, getting leaves out of the yard, finishing picking up the stuff outside. So all of the patio furniture is gone and we have a clear view of the back yard. Then inside she had to spot clean the carpet because Derby yak's up for no particulary reason, and then got out her new sucking monster! The old rug sucking monster starting making funny noises last weekend, started to smell funny too, all burny and icky. Mum says the new one sure does pick up our furs better. Oh and Derby is all hissed off. Mum forgot his blogoversary on November 3. Well it is OUR blog now, but he isn't happy. Maybe that is why he was yakking up on the carpet! Well he has been at this for 5 years now. Our good buddies, The Crew, have been at it for the same time. Max of The Crew, Derby and I all came from the same shelter. The Pack - playing the Cowboys on Sunday night in historic Lambeau Field. They win, good job both on offense and defense. Great jobs guys, take next weekend off! Grampa Brett and the ViQueens - managed to pull the game out in OT, mum was hoping those red fevver guys would win, they were ahead almost all of the game. The Colts - well, not having a good year they lost to the Eagle birds. Lots of injuries this year but we still like watching Peyton play. On a final, and sadder note, we had to say farewell to another Gorgeous Ginger. 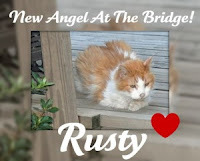 Rusty has run off to The Bridge. Mum came home with a big bag the other night. We had to check it out. You can biggify the pictures iffen you wants. Hmmm, big, round, droopy whisker. I can even soft of climbed on top of the soft, fuzzy thing. Mum came home with a new cat, but thankfully not a real cat. This one is so big it would eat all of our noms and be looking for more. Her names is Callie, the Corpulent Calico! Hope all are having a good weekend so far. Mum has been falling asleep on the couch, trying to read a book. Ducky and I have been napping lots too. Don't forget to find that extra hour that has been hiding in your clocks for the longest time. Things will get all wonky for a few days while the beans sort out when they get up and feed us. Our waterfall is back! They finally fixed/replaced the gates that hold the water back, now there is a pond is back, the gooses and fevver duckies are back too. Mum even waited around to see what happened when some beans came by with food for the fevvers. It looks a little icky yet as the weeds that grew are sort of floating there. Mum says she read that they wouldn't kill them as the water and cold this winter will kill them off. Otherwise just sort of hanging out. The election is over exepting the vote counting, yippee for no more silly ads. Busy weekend and busy week to come. Ducky and I snoozed in mum's sleepy spot while she handed out treats to sticky little and some not so little things. But like last year we didn't have that many kids, under 25 total people visiting. 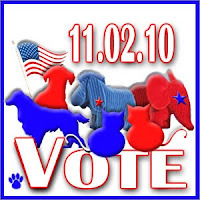 For our Mericky furiends beans you gotta go vote tomorrow. If you don't, then you aren't allowed to complain about pollyticks for the next 2 years. Plus the annual calendar is coming up. Click on the graphic below for the rules. Mum has to go through our pictures to see which ones we want to send in. This will be Ducky's first year as a calendar cat, I've done it every year so far. 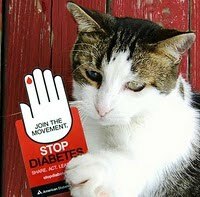 Plus for my buddy Parker and her family, we is joining in to support Diabetes month. It is a nasty thing to have. We hope that like fixing boobies in October, we can support this to rid our world of diabetes. The Pack - shutout the Jets! Grampa Brett and the ViQueens - lost to Miss Millie's guy's named Pat. Grampa Brett continued his streak of starting the game, but went out late 'cuz he got a bad cut. The Colts - don't play until Monday night.